The KEL TEC SUB-2000 is available in a few different magazine configurations. It all starts with 2 choices Glock or Multi-Mag. If you go with Glock it's a matter of choosing a grip type for the "Standard" size mags or "Compact" size mags for your 9mm or 40cal SUB-2000. If you choose the "Standard" size grip it will fit the Standard size Glock mags (G17 / G22). If you choose the "Compact" size grip it will fit the Compact size Glock mags (G19 / G23). Keep in mind that you can run high capacity magazines in your SUB-2000 like the 33 round Glock Mags. That being said you can run a "Standard" size mag (G17 / G22) in your "Compact" Pistol Grip (G19 / G23) but not the other way around. Now don't let the grip size confuse you. It’s only an option on the Glock version of the SUB-2000. 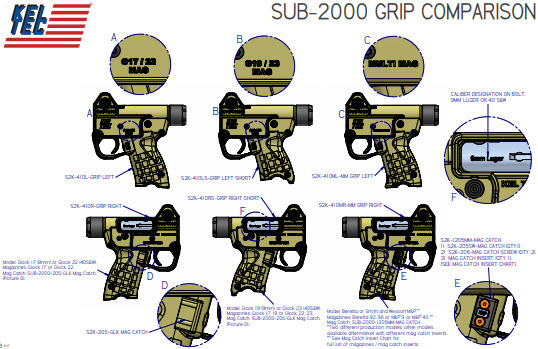 The SUB-2000 grips are designed to be universal with 9mm or 40cal but the barrels are obviously not universal and are what dictates which caliber of ammo your SUB-2000 will shoot. Now let’s move onto the Multi-Mag which can get a bit more confusing. Every magazine is different and requires a specially designed magazine catch to hold the mag properly in place inside the Multi-Mag Grip. The general shape and size of these magazines are similar enough to only require one Multi-Mag grip but are different enough to require their own separate Multi-Mag Catch. The Multi-Mag grip only comes in the "Standard" size for a wide variety of magazines. On the plastic magazine release you will notice 2 screws that are designed to hold a steel mag catch in place. Different magazines can be used by replacing the steel mag catch. KEL-TEC offers a wide variety of replacement Mag Catches to allow the use of different magazines in the Multi-Mag Grip Platform for the SUB-2000. The Multi-Mag Base is a universal magazine release in that it allows you the option of changing out steel mag catches. At the time of this writing the following magazine catch variations are available for the Multi-Mag Grip on the SUB-2000: Smith & Wesson M&P Mags, Sig Sauer P226 Mags, Beretta 92 & 96 Mags, CZ 75 Mags, S&W 59 Mags, CANiK TP9 Mags. Now let’s go a step further…..Say you want to make a SUB-2000 Multi-Mag into a Glock version….well you can! Get Factory KEL-TEC Parts here. Don’t forget to pick up a New Extended Mag Release from us. If you’re going from a Multi-Mag Grip to a Glock Grip you will need to order a new Glock Extended Magazine Release. If you’re going from a Glock Grip to a Multi-Mag Grip you will need to order a new Multi-Mag Extended Mag Release. Just remember to order your Multi-Mag Catch from KEL-TEC for the specific magazine you want to run in your SUB-2000. Keep in mind if you will be ordering the Mulit-Mag Base you will need to also pick up a magazine specific mag catch. Remember the Multi-Mag Base is not compatible with Glock Mags. The Multi-Mag Base has two screws holes that allow you to swap out steel mag catch bases. Yes you can change out mag catches to change which type of magazines your SUB-2000 will accept. All you need to do is pick up the appropriate mag catch. You won’t find a Glock Mag Catch because the Glock mags require a completely different grip set. The different Mag Catches available to you for the Multi-Mag, range from the Smith & Wesson M&P, Sig Sauer P226, Beretta 92 & 96, CZ 75, CANiK TP9 and Smith & Wesson 59. KEL TEC has continued to add more magazine configurations to the Multi-Mag Catch available options on their website. In Summary, when buying a SUB-2000 you first need to decide whether you want to shoot Glock Magazines or one of the Multi-Mag Options (Smith & Wesson M&P, Sig Sauer P226, Beretta 92 & 96, CZ 75, CANiK TP9 and Smith & Wesson 59). If you’re buying a Glock version SUB-2000 then you need to decide whether you will be shooting the Standard Size Magazines (G17/G22) or the Compact Size Magazines (G19/G23). If you want to go from a Multi- Mag to a Glock, you can but it will require a new set of Grips from KEL TEC. Remember you can take your pick of 3 color options (Black, OD Green or Tan) and if you want to change the color of the Forend while you’re at it you can for an additional $60. Bottom line if you can’t find that Tan SUB-2000 Glock 9mm you’ve been looking for….then you can always make your own by converting the grips and mag release of some other 9mm SUB-2000 you found on GunBroker!